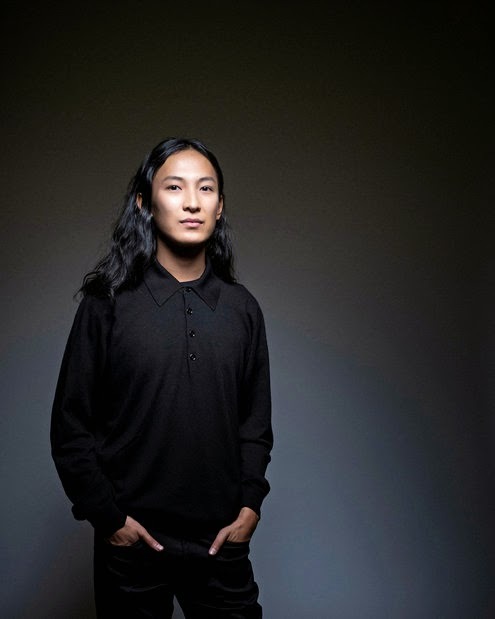 The list of what the 30-year old designer Alexander Wang does not look like is long. He does not look, at first glance, like a symbolic figure. He does not look like someone who could change the prevailing wisdom of his industry. He does not look like the boss of a storied Parisian atelier. He does not look like a facile juggler of brands, people and responsibilities. He does not look like a lightning rod. And he does not look like a Ping-Pong ball, although he claims to occasionally identify with the concept. What he does look like is a chirpy, black-clad club kid with a messy ponytail. But if fashion teaches us anything, it is that appearances can be deceiving. Because Mr. Wang is all of the above. In 2012, five years after inaugurating his eponymous brand and becoming a darling of the New York contemporary fashion scene, Mr. Wang shocked the fashion world when he was also named the creative director of Balenciaga, becoming not only the first American designer in over a decade to run a heritage French name, but the first designer since the recession to attempt to run two houses — and the first since John Galliano, the artistic director of Christian Dior, blamed his 2011 drug-and-alcohol-fueled implosion on the pressures of running both Dior and his own brand. Now Mr. Wang spends his time flying between Paris and New York; a TriBeCa apartment and a five-star hotel in the 16th Arrondissement of Paris; his home country and a country where he does not understand the language; the worlds of a family owned independent company and the world of a giant conglomerate (Balenciaga is owned by Kering, the French luxury group that also owns Saint Laurent, Gucci and Alexander McQueen, among other brands). And in doing so, he has become the poster boy for a renewed debate in the fashion world. “The million-dollar question is how much is one designer able to have two mind-sets?” said Robert Burke, the founder of an eponymous luxury brand consultancy and a former fashion director of Bergdorf Goodman. As he enters his fourth season as a dual citizen with spring-summer ready-to-wear, Mr. Wang, who has also taken on designing a third collection for H & M, due out in November, finally feels comfortable enough to provide some answers. “I felt like I had another voice inside me,” he said one morning two weeks before his spring-summer show, while poking at some berries and yogurt at the Tribeca Grand, a hotel a few blocks from his office, which was being renovated (the timing was, he admitted, “not great”). His choice of words, while joking, is not entirely accidental: In recent years the fashion world has been rocked by the suicides of Alexander McQueen and L’Wren Scott. And though neither was blamed on the industry (or not entirely), there was much discussion of the way the pressure has ratcheted up along with the pace, which now demands, at the very least, four new collections a year — for one brand. Double that, or, if men’s wear and accessories are included, quadruple it or quintuple it, add in assorted global flagship openings, and it’s impossible not to wonder if anyone can be creative enough to sustain the quality of what can amount to more than 30 collections a year. Is it possible to have the mental, emotional and even physical stamina? On one side are those who believe that focus on one house is the best way to ensure success: Marc Jacobs, who last October left his post at Louis Vuitton after 16 years to “concentrate on his own brand”; Hermès, which recently switched strategies and appointed its first women’s wear artistic director in 14 years not to have another brand; and Riccardo Tisci, who closed his own brand when he joined Givenchy in 2005. On the other are a growing group of new-gen names who, like Mr. Wang, believe two can be better than one. Jonathan Anderson, who turns 30 this month, was appointed creative director of Loewe last autumn and will maintain his eponymous brand; 31-year-old Jason Wu, founder of his own brand, was also appointed creative director of Hugo Boss women’s wear in June of 2013; Zac Posen, 33, founder of his own brand, is, as of this summer, also creative director of Brooks Brothers women’s wear; and Jeremy Scott, 39, took on Moschino as well as his own brand last year. Meanwhile, of the first generation to embark on the two houses/one designer model — Michael Kors, who from 1997-2004 was also creative director of Céline; Narciso Rodriguez, who worked at his own line and Loewe from 1997-2001; Tom Ford, who had both Gucci and Yves Saint Laurent from 2000-2004; not to mention Mr. Galliano and Mr. Jacobs — only Karl Lagerfeld is still doing double duty (or triple: at Chanel, Fendi and his own brand). Is the new group simply too young to know better? Or is there a more fundamental shift going on? Alexander Wang last fall with Victoria Traina, left, and Vanessa Traina at the opening of the Balenciaga New York flagship boutique. Mr. Wang, who grew up in San Francisco, dropped out of Parsons the New School for Design after two years to start his own business in 2007; it has since grown to include men’s wear and a less expensive line, T by Alexander Wang, for both men and women. On the other hand, the situation has been leavened by the lifestyle difference between Europe and the United States: In August, when Italian factories close, Mr. Wang is free to focus on his eponymous brand; since his New York show occurs two and a half weeks before the Balenciaga show, following the Wang presentation, he goes immediately to Europe, where he stays through the show to shoot the look book and ad campaign. In turn, this gives his Wang team time to get to prototypes for accessories made in Italy, so when he returns they are ready for review. Mr. Bazan said they were careful from the beginning to keep the Wang and Balenciaga design and corporate teams completely separate, to avoid cannibalization. The only shared employee is an assistant who travels with Mr. Wang between brands (he also has an assistant who deals with Wang and his personal organization). Though the fashion world initially speculated that Mr. Wang’s appointment at Balenciaga meant the erstwhile couture brand, known for its founder’s purism and the boundary-pushing vision of its former creative director Nicolas Ghesquière, would come “down from its lofty pedestal,” as Suzy Menkes wrote in The International New York Times, Mr. Pinault said that it was exactly the difference between what Mr. Wang’s own brand stood for and what Balenciaga represented that first drew their attention to the designer. While it is true that Mr. Wang’s Balenciaga is notably more approachable and less creatively ambitious than that of Mr. Ghesquière (kind of the Balenciaga for non-Balenciaga obsessives), it has not been trivialized to the extent his critics feared. Last season’s bonded cable-knit coats and cocooning pearl-shouldered knits over slick black-tie trousers clearly fulfill his Kering-given mandate to bring some modernity and youthful energy to the house. And if its founder, Cristóbal Balenciaga, was never particularly concerned with keeping up with the times, as the critic Kennedy Fraser pointed out in her 1981 book “The Fashionable Mind,” so it goes in fashion: Houses evolve or they become irrelevant. If anything, Mr. Wang’s access to the Balenciaga atelier and factories seems to have pushed his thinking at his own brand; his last show, which featured astrakhan T-shirts, leather cargo pants and 1960s minidresses hiked forward by contemporary utility detailing, was notably more sophisticated than what had come before. Still, Mr. Wang does admit that on occasion his Wang-Balenciaga liaison will whisper, “that looks a lot like something you just did for [fill in the brand],” and he will take a step back and realize she was right. As his business and his responsibilities have grown, Mr. Wang said he has made certain changes in his life. The former party boy no longer goes out during the week. His only vacation this summer was a week in early August when he visited his family in San Francisco. “When I saw everyone’s Instagrams of their summer holidays, I did feel a little pang,” he said. And he has learned to deal with isolation. The fact that he does not speak French is not an issue at work (almost everyone speaks English), but it does mean that he has given up on the idea of an apartment. “What if the electricity went off, how would I call anyone?” he said. Mr. Wang, right, with Joseph Altuzarra and Vanessa Traina in 2011. As to whether he is a role model for his peers or those who will come next, Mr. Wang refuses to be drawn. Judging by the numbers, the decision to do two brands has been productive. The Alexander Wang company has been growing by approximately 20 percent a year for the last three years, had 2013 revenues of just over $100 million and will have 20 stores globally by year end; in 2015, it is to open its first free-standing European store, and largest store over all, in London. Meanwhile, Balenciaga is also experiencing double-digit retail growth, Mr. Pinault said. Even Mr. Altuzarra said he could imagine doing more than one brand, and would consider it if the right opportunity presented itself. Mr. Burke said he saw the current employment trend as simply the natural swing of the fashion pendulum. Mr. Pinault, who pointed out that Hedi Slimane, the creative director of Saint Laurent, also has a career as a photographer, said he agreed. Even Mr. Kors said he believed social media had transformed the situation. It is possible, of course, that Mr. Wang may reach a tipping point, and like Mr. Jacobs or Mr. Kors, decide that for his own brand to truly explode he needs to devote himself to its care. Or that he needs a different kind of balance. “Right now I don’t have kids, I don’t have a dog,” Mr. Wang said. “At some point maybe I will want more of a personal life, or I will think, ‘I just can’t get on that plane again,’ but I have not put a time limit on it. When I think about stopping and just going back and doing Wang ....” He paused and shook his head.